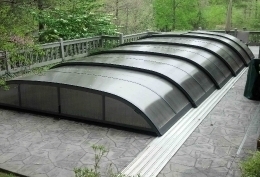 “We have been exceedingly pleased with the performance of my Elegant pool cover, which we installed in 2010 for our in-ground pool in the western North Carolina mountains, near Asheville. The cover maintains a constant water temperature and extends the swimming season well into fall. 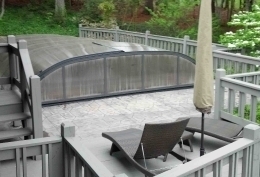 It also avoids problems with leaf litter while the pool is in use, protects pool accessories during pool use and provides security against unauthorized use when unattended… The attractive Elegant design allows swimming and water exercising in the closed position, when sliding overhead panels are opened or when the cover is retracted completely off the pool.